Ready to See If BNI Is The Right Fit For You? Come Visit Us! Click here to see an alphabetical list of all local chapters. Click here to use our interactive map to search based on chapter location. 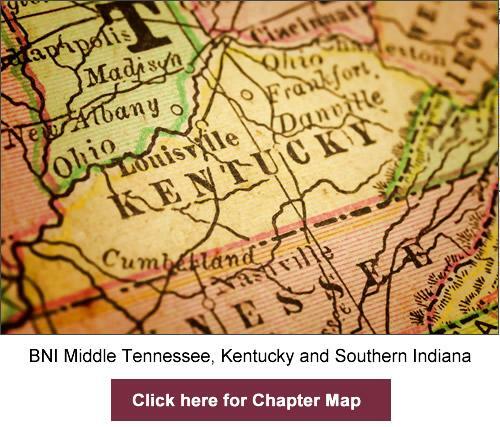 Click here to see chapters currently forming in the BNI Middle Tennessee, Kentucky and Southern Indiana region. If you are interested in starting a new chapter, please call Jim L-D, Director of New Chapter Development for BNI Middle Tennessee, Kentucky and Southern Indiana at (502) 528-0894. The best way to find out about BNI is to visit a chapter. Visitors may attend chapter meetings twice ONLY (one chapter twice, or two chapters once each), before making a decision about joining.